FILE - Tourists wait for their flight, as an Egyptair plane is seen, background, at a waiting hall in Cairo's international airport in Egypt. 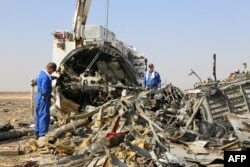 Russia's state aviation agency has banned Egypt's national carrier from flying to Russia, amid speculation a bomb was planted on the Russian airliner that crashed last month in Egypt's Sinai Peninsula. Rosaviatsiya on Friday notified Domodedovo airport in Moscow, where Egypt's air flights arrive, that the ban is effective starting Saturday, according to airport officials. The aviation agency did not give an immediate reason for the ban on flights. The move follows a decision by Russian President Vladimir Putin to suspend all Russian flights to Egypt after the October 31 crash of a Russian passenger jet in Egypt that killed all 224 people aboard. Foreign intelligence has indicated the possibility of a bomb blast aboard the jet, with Russian Prime Minister Dimitry Medvedev, U.S. President Barack Obama and British Prime Minister David Cameron have said it may have been a terrorist act. Militants claiming affiliation with the Islamic State group claimed responsibility for the disaster, saying it was revenge for Russian airstrikes on IS targets in Syria. The head of Egypt's investigation team says no conclusions have been reached about what brought the airliner down.